Our Solid Timber homes are famous for their resistance to earthquakes? 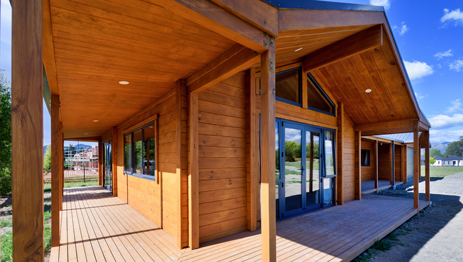 Earthquake resistant homes from our Solid Timber range in particular, performed exceptionally well during the Christchurch earthquakes of 2011, and more recently during the Kaikoura earthquakes of 2016. In one instance, one of our Solid Timber homes remained completely unscathed following the 7.8 earthquake in Waiau, despite the home being positioned literally 30 metres from the fault line. Many other homes and buildings in the same small town were decimated and in ruins. “While these buildings were reported to have moved significantly during the earthquake, the damage observed after the event was minimal, even in cases where significant ground settlement (up to 200 mm) was observed. It was noted that for Fraemohs houses built using 63mm thick (2 and 3 laminates) walls, there were some cases where small portions of the timber sections had sheared off near the bottoms of walls, as shown in Figure 43. This was reported to be the most severe damage to any of the inspected Fraemohs homes and it was noted that the failures occurred in places where the laminates were half notched, therefore having a smaller cross section. As the above excerpt shows, despite being subject to serious movement of the ground and supporting foundations, Fraemohs Homes suffered only minimal damage. This damage was observed only in those homes with 63mm thick walls. As a result, we now use 100mm thick 3 ply external walls and 60mm thick internal walls as standard so our current homes are even more earthquake resistant. For more information on why timber homes perform well in earthquakes, refer to the Timber Homes page of this website. And to learn more about our earthquake resistant Solid Timber homes, click here. 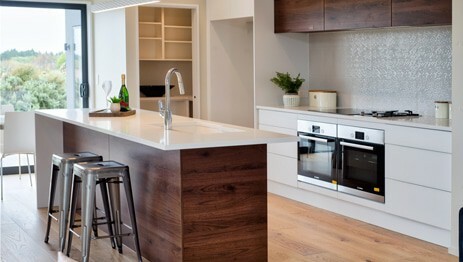 The highly durable Solid Timber, or the stylish, contemporary Timbermode - which do you prefer?